SAN FRANCISCO (Reuters) - Chinese state firms are poised to be strong contenders in the race to make high-speed trains that will sprint between Los Angeles and San Francisco, part of a $68 billion project to bring the service to the United States for the first time. While "bullet train" manufacturers from Germany, Japan, South Korea, and France are expected to be among those jockeying for the estimated $1 billion train contract, China’s ability to offer low prices and hefty financing appear to make it the one to beat, say lobbyists and industry insiders. Lacking experience in the technology, California must turn to foreign firms to build the trains – albeit domestically and with American workers - setting off a geopolitical race to grab a foothold in the nascent U.S. high-speed rail industry. Germany's Siemens is expanding its rail factory in Sacramento to incorporate a “high-speed lot.” Japan has voiced its interest, boasting a record of no fatal accidents in over 50 years operating high-speed trains. France’s Alstom, which produces rail cars in upstate New York, is also a potential contender. Awarding a piece of America’s most ambitious and expensive infrastructure project in decades to strategic rival China – over a long-term ally such as Japan - would be prone to political controversy. But a Chinese bid with generous financing attached could prove hard to resist for California’s government, which has so far secured only a fraction of the total funding needed for a project that would see trains speeding at over 200 mph (322 kph) to connect the state’s biggest cities in under three hours. 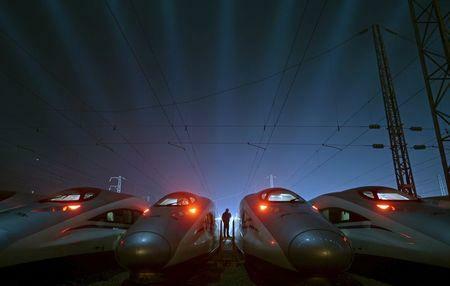 After building the world’s longest high-speed train network in less than a decade, China has made exports of the technology a priority, pushing to build thousands of kilometers of track in countries such as Turkey, Saudi Arabia and Venezuela. Its top leaders rarely make a foreign trip without touting the industry. State-owned locomotive makers China CSR Corp and China CNR Corp last December announced plans to merge in a $32 billion deal, creating a formidable global competitor backed by generous public financing. CNR Tangshan Railway, a unit of CNR, and CSR last October made an official expression of interest in supplying the trains to California, and are now expected to launch a joint bid. Siemens, Alstom, Japan’s Kawasaki Heavy, South Korea’s Hyundai Rotem, Italy's AnsaldoBreda, Spain’s Talgo, and Canada's Bombardier also expressed interest. China CNR and China CSR declined to comment when asked about their interest. U.S.-based SunGroup USA, which has been working with China CNR, said it had identified a possible factory site for China to make the trains in the city of Oakland, where California Governor Jerry Brown was a two-term mayor. Two years ago, Brown rode a Chinese bullet train and met with rail officials during a trade mission to China. 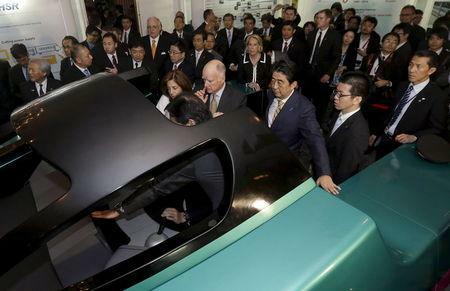 Last month, Brown was wooed by Japanese Prime Minister Shinzo Abe, who showed off a model of a bullet train while on a visit to the United States. 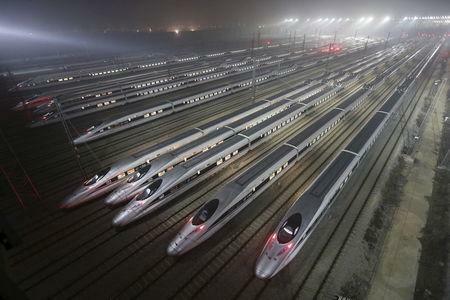 The United States lags far behind Europe and Asia in high-speed rail. President Barack Obama planned to make high-speed rail his signature transportation accomplishment but most of the country’s dozen or so projects have struggled to gain traction. California is the farthest along, although funding remains a major hurdle, and the 520-mile (837-km) long Los Angeles to San Francisco route isn't projected to open until 2029. Construction on the rail line began last year near the middle of the route in Fresno, a city in the state’s Central Valley. Only about $13.2 billion of the estimated $68 billion has been raised, plus a pledge of cap-and-trade proceeds - funds paid by companies to offset carbon emissions. CHSRA, which will issue details of the bid for an initial 16 trains later this year, could consider financing in addition to technology and price when it selects a train maker in 2016. “We would certainly like to see a financing component,” said CHRSA's CEO Morales. The South Korean government will not provide financing for the project, said a spokesman for Hyundai Rotem, the country’s sole train-maker. Japan has put together a consortium of companies to bid for the California projects and, like China, has access to cheap financing. But "they aren’t in a position to cut quite as close to the bone,” said Clayton Dube, director of University of Southern California’s U.S.-China Institute. “China would be willing to make relatively little on this in order to make it happen." China has less history with the technology than some, but has accomplished much in the past decade, building over 7,500 miles (12,000 km) of track. “They’ve come up a very steep learning curve. I’ve been very impressed,” said Morales. CHSRA plans to find a firm to lay track around the end of this year, estimated to be worth $500-600 million for the first 125 miles (200 km) in the Central Valley. China has yet to export its bullet trains, and has encountered some controversy over its other rail exports to the United States. When a joint Chinese venture that included CNR won a $567 million contract last October to supply Boston subway cars, some residents protested over allegations of human rights abuses in China. CNR submitted the lowest bid at roughly half the price of Bombardier. Safety could also emerge as a concern over a Chinese bid. In 2011, a Chinese bullet train crash left 40 people dead and stoked fears of shoddy technology. “Safety and technology come into play, and this keeps the project open to those with the most experience in high-speed rail - Japanese, French and German interests,” said Tom McMorrow, a principle at the law firm Manatt, Phelps and Phillips in Sacramento, who works on international trade issues, including representing Japanese rail interests.